The ETC is delighted to congratulate Professor Jessica Hammer on being chosen as one of the inaugural recipients of the Moran Career Development Professorship. The purpose of this fund is to support a career development professorship, the recipient of which shall be a junior faculty member seeking tenure whose appointment is in any department of the University where learning science research can occur and who is dedicated to research that studies and improves learning, particularly in disadvantaged, vulnerable, and underperforming learning populations. Priority is given to candidates whose research is empirically-driven and who will collaborate across disciplinary boundaries and will integrate with and leverage other efforts at the university. With these guidelines in mind, Jessica, an Assistant Professor at Carnegie Mellon University, jointly appointed between the Entertainment Technology Center and the HCI Institute is a perfect recipient of this award as her research focuses on “games for impact”, meaning games for health, games for learning, and games for social change. Congratulations Jessica! 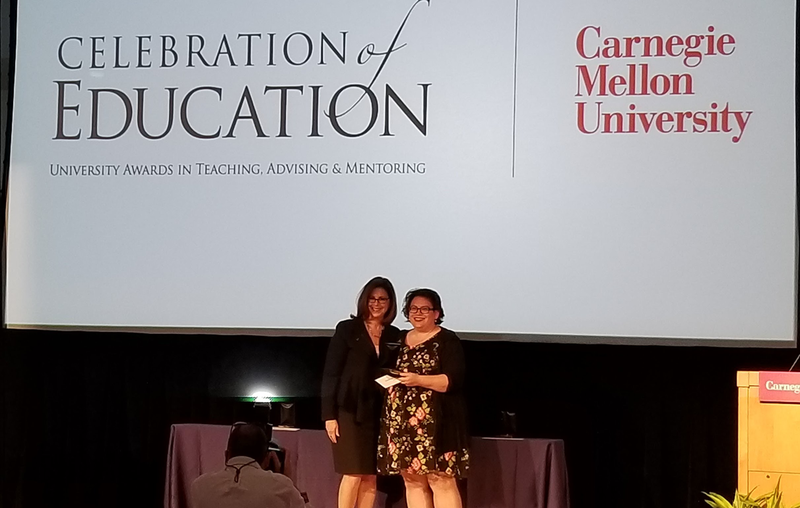 Jessica (r) with Interim Provost Laurie R. Weingart as the 2018 Teaching Innovation Award winner during the CMU Celebration of Education.